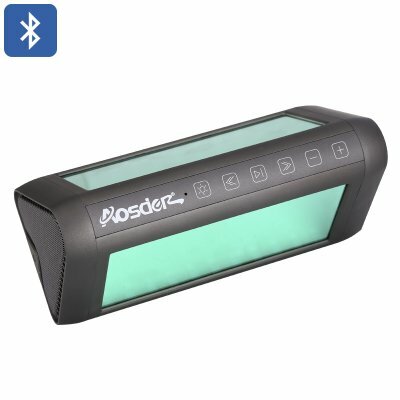 Successfully Added Aosder Magic Mirror Portable Bluetooth Speaker - 75dB, DSP Sound Processing Chip, EQ Adjustment, Built-in Mic, LED Light Effects to your Shopping Cart. The Aosder Magic Mirror is an impressive Bluetooth speaker that lets you enjoy all your favorite tracks in Audiophile-grade music quality. Coming with an extraordinary design this portable speaker features built-in LED lights that display stunning 360-degree visuals – allowing you to impress your friends not only with great audio quality but with a built-in light show as well. With its compact size and light weight design this Bluetooth LED speaker is extremely portable and can be easily carried around, making it the perfect audio device that can be used both inside as outside, providing you with the perfect portable Bluetooth speaker on which to enjoy your music no matter where you are. Featuring a built-in microphone this Bluetooth speaker does not only allow you to listen to your favorite tracks but also lets you efficiently make hands-free phone calls. Supporting Bluetooth 4.0, the Aosder Magic Mirror allows you to easily pair it with your smartphone, letting you enjoy your music library in stunning audio quality at any time of the day. Reaching volumes of up to 75dB, this portable Bluetooth speaker allows you to listen to all your songs, and to engage in hands-free phone calls, without being interrupted by outside noise. Coming with the latest sound technology this beautiful LED Bluetooth speaker truly is capable of delivering a stunning audio experience that suits the liking of any audiophile out there. With its portable design, this wireless speaker can be easily carried around. Whether you are outside in the park or in the comfort of your own living room, with the Aosder Magic Mirror you will be able to engage in hands-free phone calls and listen to your favorite music no matter where you are. Packing a built-in 3600mAh battery that can be easily recharged through a micro USB port, this Bluetooth speaker provides you with up to 15 hours of continuous usage time during which you can enjoy your music non-stop without the need to worry about battery life. With its professional DSP audio processing chip and EQ adjustment, the Aosder Magic Mirror wireless speaker delivers stunning sound. Whether you enjoy listening to Rock and Roll, Rap, R&B, Jazz, or simply like to engage in a hands-free phone call – with this wireless Bluetooth speaker you can be assured to enjoy the best possible audio quality. Along with its built-in LED lights that display a stunning 360-degree visual experience, this Bluetooth speaker is guaranteed to set the right mood and atmosphere no matter the occasion. The Aosder Magic Mirror comes with a 12 months warranty, brought to you by the leader in Bluetooth speakers as well as wholesale electronic gadgets..